It’s that time again! Garden Party VI! 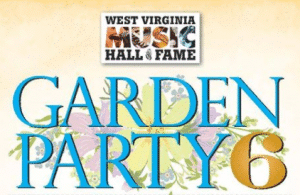 Share the day with the WV Hall of Fame – enjoy great music & scrumptious food while chatting with some of West Virginia’s great musicians! 2015 WV Hall of Fame inductee John “some kind of wonderful” Ellison… and jazz guitar master, Charleston native Vince Lewis. Bid on an item in the silent auction AND (for the first time at the Garden Party) live auction, conducted by Charleston’s Jim Strawn. Many WV artists and businesses represented! Paintings, wood & metal art, handcrafted jewelry, gift certificates to numerous restaurants, 2 nights in a yurt on the Potomac, a stay at the Blennerhassett, golf outing at Stonewall, a gift basket from Mardi Gras, Up the Creek Mustards, Appalachian Milk Soaps, Biselli Pasta, Lil’ Bit of Heaven Cakes, Sweet Imagines Custom Cakes, Paige Lucas’ hand painted wine glasses, Whitten Therapeutic Massage and many more! Buffet supplied by Café Cimino gourmet chef and dessert by Rock City Cake Company! A fabulous time will be had! Call 304-342-4412 for ticket information.